"Microsoft Corp. has been named the official provider of software and Web content for the 2008 Democratic National Convention, August 25-28 in Denver. Financial terms weren’t disclosed...Microsoft will provide nearly a dozen technologies and applications including the glitzy Surface, a table-top computer that enables users to have a variety of other interactive experiences. Microsoft’s Zune portable music players also will be used to deliver media content to convention participants." 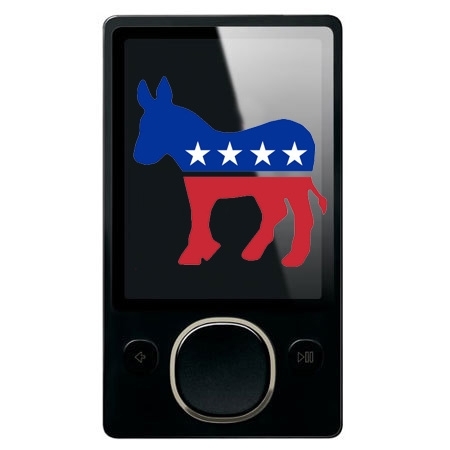 Whatever your political affiliation, I think all Zune owners can agree that this is great publicity. From being the official digitial media provider of the Olympics to now providing the Surface and Zunes for the DNC, Microsoft is stepping up in the digital media arena. I can't wait to see Zune-exclusive content from the DNC or other political organizations in the Marketplace/Podcasts area. Now that the Democratic technology vote is secured, it is highly unlikely that Apple will join forces with the GOP for fear of angering their typically liberal base. On a related note, I fail to see how Surface has any use at a political convention, but hey, that's just me. Maybe they're playing chess or something.